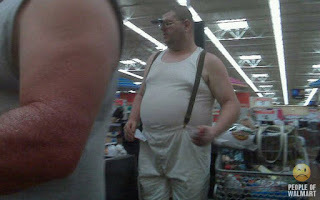 Peter Gasca: People of Walmart.com.com? In a previous post, R.I.P. Strips Malls, we theorized why traditional brick-and-mortar stores will someday disappear in favor of online shopping, for specialty items as well as for general merchandise. Future generations of consumers continue to be more connected and rely on technology, and the convenience and price advantages of online shopping will become increasingly more difficult to ignore. In order for stores to survive (if really possible), they need to innovate and change with the times ... or get crushed by those who do. Walmart seems to see the writing on the wall, investing heavily in technology and now setting Amazon.com in its cross-hairs. Currently, Walmart's revenues are 10X that of Amazon, but top line growth has stalled (really, how do you continue to grow at that pace when you already have 3800 stores and 1.4 million employees??). Meanwhile, online Walmart.com's revenues represent only 1/10th that of Amazon's, which reached a record $34B through 3Q 2011. Amazon is the clear leader in online retail, but the growing market will create room for competitors, and Walmart's strategy to capture more of this lucrative and growing market is smart (if not survivalist). 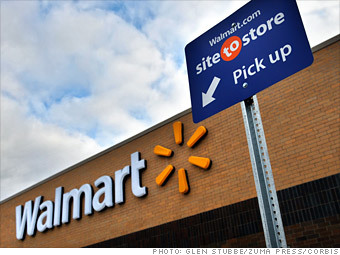 Walmart store managers are now credited with online sales in their area, encouraging employees to encourage customers to shop at Walmart.com. Shipping and pickup of online orders at a Walmart stores are not charged for shipping (Walmart also knows that order picked up at stores generate on average $60 additional per visit). Also, Walmart has introduced a smartphone app for iPhone and for Andriod and extended its Facebook presence with My Local Walmart Facebook app, all in an effort to allow its customers access to its catalog of products and "low, low prices" (and closely resembling Amazon.com's practices). Amazon is not sitting idly by. Their strategy and understanding of digital shopping experience is how they intend to stay ahead of competitors, namely the encroaching Walmart. In fact, AdAge points out that Amazon is actually going after Walmart shoppers, who are more than likely scared to find their pictures on PeopleOfWalmart.com. Amazon has already expanded its general merchandise options through its acquisition of Quidsi, Diapers.com, and Soap.com in 2011, after a successful $928M acquisition of Zappos.com in 2009. The company also launched "Amazon Mom", a free membership program for parents. Clearly, they are aggressively looking long term at holding their position while attracting the consumers migrating from stores to online. But Amazon.com is not the company at risk here. Walmart is saddled with its 3800 stores (and growing), so it cannot just turn the behemoth on a dime. Unfortunately, their online sales haven't seen the same growth as Amazon's, which is up 40% over 2010. Regardless, it's clearly a strategy that is needed, and although most people look at Walmart as stalworth, it is taking a leadership role in pioneering change and innovation that even small companies should take to heart. Copyright Peter Gasca 2014. Simple theme. Powered by Blogger.